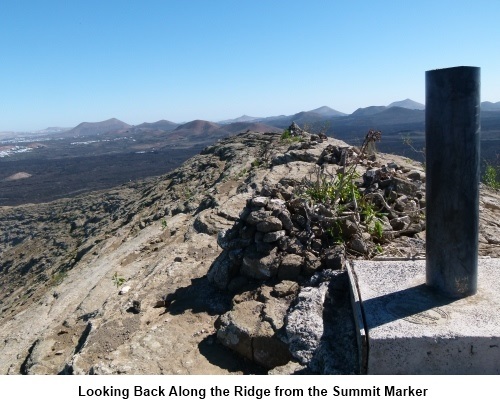 Introduction: This is the “must do” walk for anyone independently walking on Lanzarote. It takes you across a dramatic lava field and up the outside of a spectacular volcanic crater. 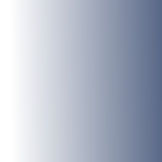 On reaching the rim, a fine ridge walk is then possible around its circumference. 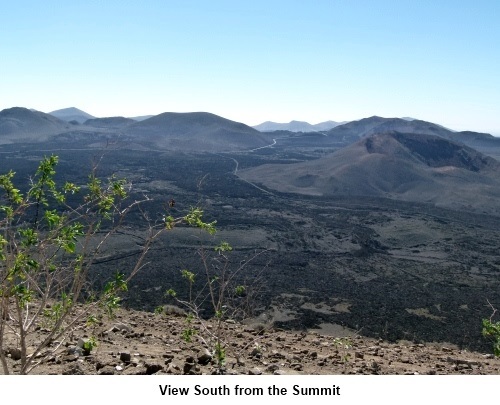 The views are fantastic in all directions and many other volcanic creations are visible. It definitely has the “wow” factor. Please take sun precautions on this walk. There is not a square inch of shade. Also take plenty of water. I took 1½ litres with me, drank the lot and could have drunk more. 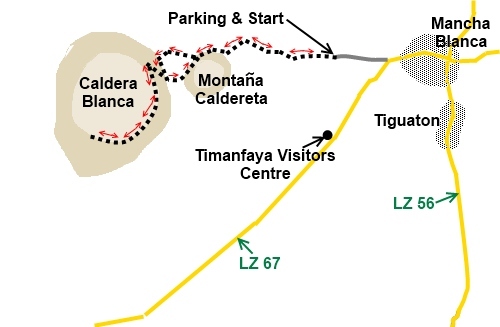 The starting point for the walk is a car parking area at the end of a good condition dirt road just ¼ mile west of the village of Mancha Blanca where the LZ 67 turns south west. Turn west off the bend and follow the dirt road until you can go no further. There is a parking area and an information board. Start: With the information board to your right, walk straight ahead and the marked out footpath is obvious. 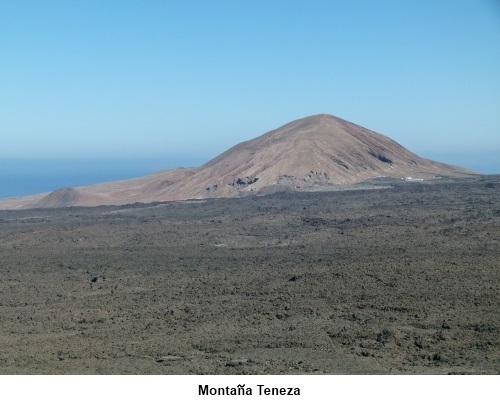 You can see your destination Caldera Blanca ahead with the Montaña Caldereta in front of it. Continue along the meandering footpath and eventually it forks. Take the right fork. If in any doubt, you will by this time be able to see the peculiar rock formation in the photo below. Head for this. Just near it, you will pass some stone animal pens (probably for goats). 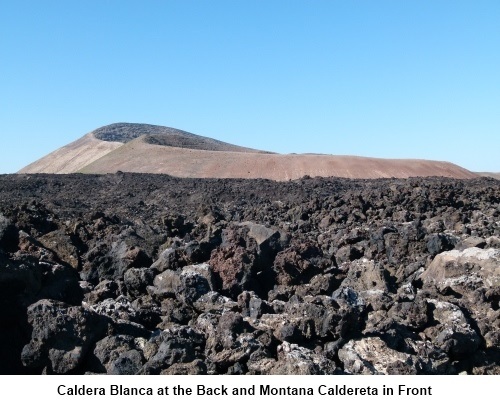 You are now at the foot of the Caldera Blanca cone and will be able to see the path gently climbing diagonally up its flank. Turn left and follow the base of the cone until you reach this path. 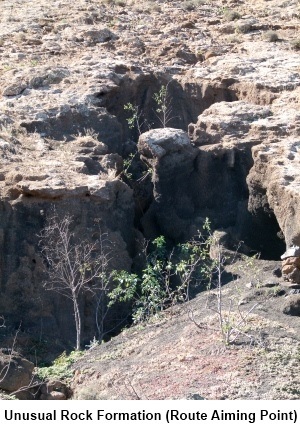 On reaching the top of the crater, after marvelling at the sight, turn left to follow the rim to the summit marker. From here, I believe it is possible to walk round the crater but there is a descent and ascent and quite honestly in the heat on the day I did the walk, I took the softer option and retraced my steps back to the base of the cone. Here, go right and follow the path across to Montaña Caldereta. This is less distinct than the outward path but fairly easily discerned. At Montaña Caldereta, follow it round clockwise and rejoin your outward path. Turn right to get back to the car park.